It’s easy for anyone to lose sight of what the holiday season is really about with all the parties, presents, special treats and stress we have this time of year. Teaching kids about the true meaning of the holidays is especially hard, but there are some things fathers can do with their children to help them realize that it’s better to give than to receive. Encourage your kids to make gifts for family members and friends. There are endless possibilities for all ages and levels of creativity. Search online for family or kid crafts or visit your local arts and crafts store for ideas and supplies. This will help them learn how happy simple things can make someone else. Choosing a charity to donate to or volunteer for as a family is another great way to teach the true meaning of the holidays. Churches and community centers can be a great resource for finding people in need. Or, if you know of someone personally who may need extra help – like a neighbor who’s unable to shovel his or her driveway – encourage your kids to step up and offer assistance. Baking cookies and delivering them to a nursing home or family shelter can also teach kids the importance of giving to others. Saying "thank you" to local police officers and firefighters with cookies and a homemade card is a good idea as well. As with most of life’s lessons, it’s important for your kids to learn from your example. 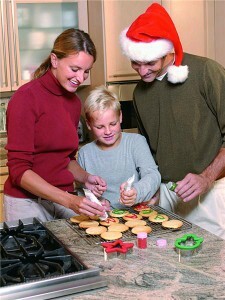 Take some time to focus on what’s really important this holiday season and model the holiday spirit for your family.